Iron ore giants Vale and BHP just dealt a death blow to the 40-year old system of negotiating prices annually with Asian customers. They’ve moved to a short-term quarterly contract system, and reportedly secured price hikes as high as 90% in the process. Sumitomo Metal Industries Co., Japan’s third-biggest steelmaker, agreed to pay Vale $100 to $110 a metric ton for the three months beginning the April 1, spokesman Toshifumi Matsui said. 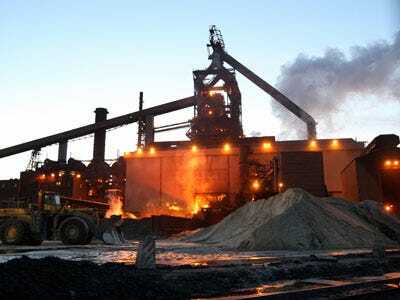 BHP, the world’s largest mining company, today said it will sell the majority of its production to Asian steel mills on shorter-term contracts without giving pricing. “If the industry moves to a quarterly pricing, that will in fact be a true market mechanism, not driven by anyone in particular but driven very much by market forces,” Sam Walsh, the head of Rio Tinto’s iron ore operations, said March 24. The concession by Asian steelmakers speaks to both A) the bargaining clout of the world’s few major iron ore producers and B) the enormous demand and booming prices Asian steelmakers are seeing. To accept huge price hikes for iron ore shows they are sold on the current China boom, since China accounts for over a third of global steel demand. Yet the on frequency could also work out to their benefit. If China slows and steel prices fall, they’ll be able to, hopefully, adjust down their iron ore input costs more rapidly.